This book guides you through diverse real-life projects to get you started; it presents most aspects of Spring Boot, going from basic to advanced topics.Key FeaturesGet up to date with the defining characteristics of Spring Boot 2.0 by building wide range of productsLearn how to develop high performance, reactive, asynchronous applications with Spring BootApply your knowledge to create robust and scalable microservices based applications using Spring BootBook DescriptionSpring is one of the best tools to develop web, enterprise, and cloud ready software in the market. The goal of Spring Boot is to provide a set of tools for quickly building Spring applications that are easy to configure. Spring Boot makes it easy to create and run production-grade Spring based Applications.. 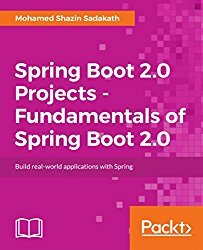 This book will teach you the several features of Spring Boot 2.0 by building interesting real-world projects, going from basic to advanced topics.You will start off by creating a web application using Spring Boot. You'll be then taken through creating a Spring Boot based simple blog management system which uses Elasticsearch as the data store. Moving ahead, you'll build a RESTful web services application using Kotlin and Spring webflux framework - a new framework which helps in creating reactive application in a functional way. Then, you will build Taxi Hailing API with Reactive Microservices using SpringBoot. You will then build a Twitter clone with a Spring Boot backend. Finally, the book will teach you how to build an Asynchronous Email Formatter.What you will learnLearn fundamental Features of Spring Boot 2.0 Gain in-depth knowledge on how to customize Spring Boot 2.0 ApplicationUse Spring Data JPA, Spring Web MVC with Servlet 3.x and Spring Thymeleaf to develop a basic web applicationUse Redis to build a Taxi Hailing API Use Spring Data Elasticsearch, Spring Web Flux and Apache Freemarker to develop a simple blog management systemBuild a reactive RESTful web service with Kotlin using Spring Boot Use Apache Kafka to enable asynchronous messaging between Spring Boot applicationsUse Spring Data JPA, Spring Web Flux and Angular JS to develop Twitter cloneWho This Book Is ForThis book would be beneficial for readers with basic knowledge of Spring Boot and Java.